The Dubai Frame is an iconic structure located next to the star gate in Zabeel Park, Dubai. It is a colossal rectangular picture frame. It has two towers and they measure 93 meters in width and 152 meters in height. The top of the frame is formed by a 100 square meter glass bridge. This observatory bridge gives two views of Dubai, of Old Dubai in the North and New Dubai in the South. 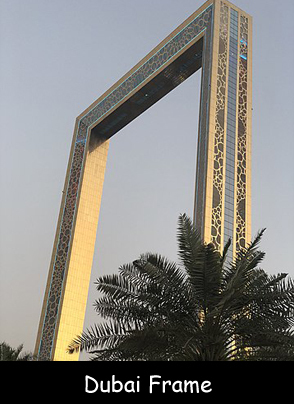 The official opening of the Dubai Frame was held in January 2018. The entire Dubai Frame is covered in gold-colored stainless steel cladding. Approximately 2,900 square meters of laminated glass has been used in the construction. At the mezzanine level of the structure, there is a fabulous immersive museum and gallery. The Dubai Frame was designed by Fernando Donis and the design was selected in 2009 as the winner of the ThyssenKrupp Elevator International Award. The structure has been a long-time coming as it was originally set to be opened in 2015. It was originally designed to frame Dubai’s complete development – past, present and future. The entire frame has a honeycomb like design on it, which is a reference to the Dubai Expo 2020’s symbol. It also hosts a vortex tunnel that creates the illusion of time travel through a warp vortex to fifty years from now. These illusions are created with special lights and sound effects, and interactive projections. The approximate cost of the project is Dh 160 million that amounts close to $44 million. Declan, Tobin. " Amazing Dubai Frame Facts for Kids ." Easy Science for Kids, Apr 2019. Web. 25 Apr 2019. < https://easyscienceforkids.com/dubai-frame/ >.